In my post I commented that in being vulnerable I decided to post a picture of my "authentic self". It was 1:30 p.m. and I hadn't gotten dressed or made myself look pretty. I realized after posting it that I should explain better why this is my authentic self and what I believe it means to be your authentic self or the "real" you. There are many people who use the term "authentic self" or the "real me" as an excuse to do what they want when they want to do it. Some people (including myself at times) use their trials or challenges to define their authentic selves. "I'm sad because (such and such) happened to me. That's just who I am." "I overeat. That's just who I am." My question is this, "Is that true? Are those choices or trials really the true you?" These things don't define the authentic you. They do however stand as stepping stones on your path to finding your true self. The real us is more than what happens to us. More than the choices we make. We are powerful, divine, imperfect beings working towards perfection with the Lord. We were created in God's image. We are designed to reflect the glory, divinity and nobility of God. We are divine beings with divine DNA. WE ARE DAUGHTERS AND SONS OF A HEAVENLY FATHER! He loves us and would not make us to be anything less than amazing! He created each of us with certain talents and abilities that help us shine in a world that is getting darker every day. We can choose to dwell on our circumstances and choices and remain a victim, locking our authentic selves--what He created us to be--away, or we can choose to learn and grow from our challenges, trials and learning experiences. It's our choice! We get to choose to be great! We get to choose to be light! We get to choose to live in our Soulful Brilliance! The Lord knew it would be hard for us to live in this world and become the true person He created us to be. He gives us trials or learning experiences not to beat us down, but to help us learn, grow, and become like Him. He doesn't want our trials to define us. They are meant to help us discover our strength. Both our personal strength and the strength we have with Him. They are meant to help us chip away at our outer layers, our natural man, and discover our true, authentic self. Our Soulful Brilliance. To discover the person He created us to become. In that discovering process we move not all at once, but step by step toward the perfect, complete self we were created to be. It is our perfect growth process. The perfect path for us individually to discover our authentic selves. We grow and develop in each season of our lives, taking little steps to uncover and become a little more of the person we have the capacity to be. I've recently stepped into a new season of my life and have begun discovering a new part of my authentic self. In the picture above I was my authentic self not because I wasn't dressed up or wasn't wearing makeup, but because part of my authentic self is being a mother who doesn't always have a chance to get dressed before 3 p.m. or make myself look "pretty." Right now being a mother is hard for me. I don't get to see a lot of cute smiles that other people see from her. Instead I get to listen to lots of crying and having nothing I do comfort her. I get to stay up a good portion of the night because she's not feeling well and will only sleep while I hold her. I get to let a lot of things that were important go so I can take care of someone more important. I get to give up a lot of who I thought I was to be everything to one tiny human being. Sometimes I feel like I've lost myself. I feel guilty for complaining when I have so many friends and family who long for children or who have lost their little babies... 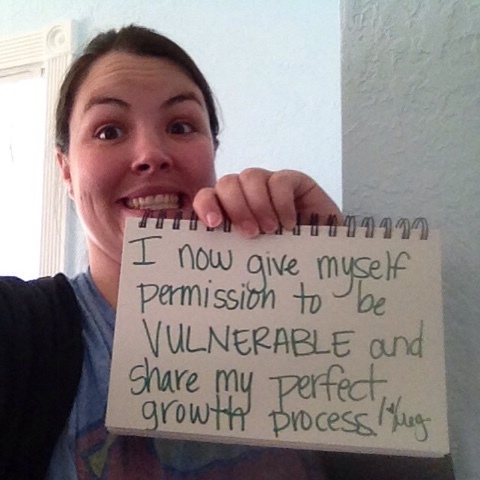 I feel so guilty for even thinking all of this stuff, but I'm committed to being vulnerable. Being a mom isn't always rainbows and sunshine, but even in the midst of my feeling weak and not enough and guilty, I feel so much love and tenderness for this sweet daughter of mine. I do my best to focus on the little things. The moments when I realize I was meant to be a mother. The huge grin she gets when she hears the voice of her 3-year-old cousin. The little smiles and giggles when she's just this side of sleep. (I wish I new what she was dreaming about!) I love to watch her with her dad. I love the baby cuddles I get when she falls asleep in my arms. I feel the hand of my Heavenly Father helping me be strong enough to wade through this part of my perfect growth process. I feel the angels surrounding us and helping all three of us as we learn and grow in this new step of our life. I still struggle with not letting my learning experiences define me, but I am also learning all new things about myself. I can feel myself growing and becoming. Stepping into another level of my Soulful Brilliance! God is good! He is there helping us along the way. Helping us discover our authentic selves. Our Soulful Brilliance, so we can build the Kingdom and assist other people in discovering and living in their own Soulful brilliance. What have you been discovering about your authentic self? What steps can you take to dig a little deeper and uncover more of your Soulful Brilliance? I hope and pray that you will feel the hand of the Lord as you work towards finding your authentic self! It was Mother’s Day and I was sitting in church when my 3 year old granddaughter came over and showed me a crinkled up paper in her hand. As she unfolded the paper and smoothed it across her grandpa’s hand I noticed it was the paper to a Luden’s Cherry Cough Drop. In that singular moment I smiled and teared up as I remembered sitting in church with my grandmother and reaching into her purse looking for something particular—that white box with the red cherry on it. I would hand it to her and watch her slender fingers reach inside the box to hand me a Luden’s Cherry Cough Drop. At that moment such tender feelings sprang to my heart and mind as I thought of the treasure that sweet, small woman was to me. Her influence has permeated every measure of my life. I grew up next door to her and my siblings and I could always be found in her kitchen chatting about such simple things. We were always welcome and treated as if the most important part of her day was being with us. Our conversations ranged from how to cook, her dreams for us to attend college, how much she loved our grandfather and memories of her years growing up in Grace, Idaho with her widowed mother and her brothers. I recognized today that those visits and conversations shaped my ideals for faith, family and fortitude. She attended church and served in many callings. She supported her husband as he served as a bishop for nine long years. She and grandpa looked for the less fortunate and actively worked to relieve their distress. I remember her bathing me as a child when my mother was too ill to care for me. I watched her lovingly prepare meal after meal for her entire family during the cherry harvest and I never once heard her complain about it. I watched her beautiful hands care for her aging husband as his body became frail and weak. I cried as her mind became ravaged by Dementia and finally succumbed at 90 years of age. Her nourishing light became a link to my future and I believe to the legacy I hope to pass on to my children and grandchildren as I visit with them, cook meals for them and care for them when they are downhearted or ill. My life would be so different had I not been nurtured by someone so selfless. I hope she looks down on me and recognizes the light of her love in my actions and life. I love you forever Grandma. I challenge you to take the time to write in your journal this month on how family links have nurtured your light. In addition, I encourage you to reach out to a member of your family and write them a small note about how their influence and love has nurtured your light. I can’t write grandma a thank you note but I can thank Heavenly Father for the gift of my dear, sweet grandmother.